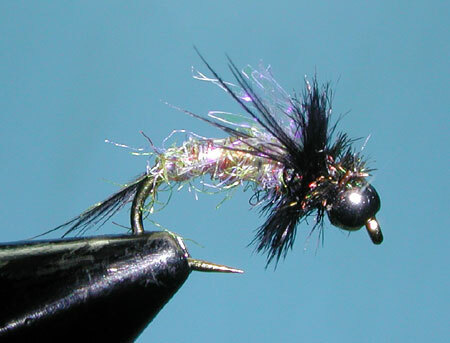 Notes: The Good 'N Plenty Nymph is a caddis pupa designed by Sierra Flyfishing Guide, Hogan Brown. This nymph is found throughout many of the fly shops within the Sierras. The Good 'N Plenty is tied on a curved hook with a Tungsten Beadhead to get the nymph deep within the water column. The nymph has all of the elements one looks for in a good pattern. The abdomen is a ribbed and tapered body utilizing a blended mix of synthetic poly which allows the fly to sink. Tan or Green colorations are usually used for the body and the fly is tied in sizes 12-14.There are legs tied onto each side of the fly using a soft hackle that provides plenty of movement. Ostrich herl and peacock herl provide a lifelike collar giving the fly the contrast necessary for attraction. And the tuft of OV Pearl Krystalflash as a wing provides a lifelike shimmer. Hogan guides for Sierra Flyfishers and FishFirst! out of Chico, CA. concentrating on the North Yuba and NF of the Feather River within the Sierras. He also guides the Pit, and the lower Sac as well. 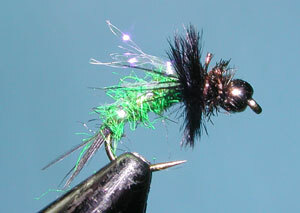 His flies are marketed through Idylwilde Flies which has a number of contract tiers such as Bob Quigley, Ken Morrish, Tim Fox, and Ed Engle.